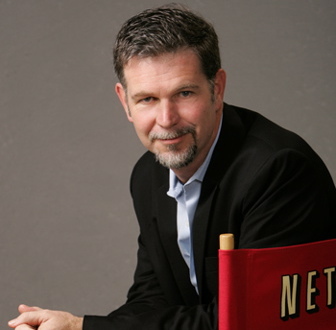 Netflix said it plans to invest “a couple of billion” dollars in new content deals as it challenges Amazon’s Lovefilm and Sky in the UK, as its chief Reed Hastings told the Daily Telegraph the service would easily outcompete LoveFilm: “We offer a much better user experience than Lovefilm with HD video streams available. We are on more platforms, such as Nintendo Wii and we have a broader content offering. The hefty outlay comes as it enters a much more competitive market than its native US, as it also faces competition from pay TV providers Sky, BT and Virgin Media as well as retailers such as HMV and Tesco. The company has said the cost of entering the UK will push it into a loss in the first quarter of 2012. “We are focused on getting to multiple millions of members in the UK over the next few years,” Hastings told the FT. “It doesn’t really matter how much in the short term. Our first focus is on member satisfaction not on quantity. However, after launching in Canada and Latin America since 2010, Netflix plans to ensure existing markets are nearing profitability before expanding further. The streaming service, which is now available to everyone in the UK and Ireland for £5.99 a month was immediately undercut as LoveFilm set the price of its LoveFilm Instant from £5.99 to £4.99.